In Seaslugs - Part II, I will introduce you to the next two in hierarchical sequence. 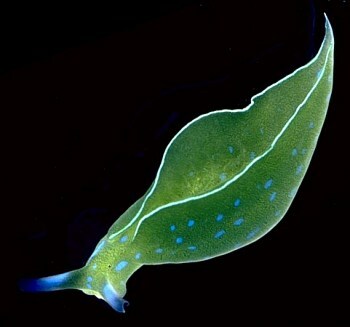 Seaslugs are indeed fascinating creatures and are a favorite for many photographers. They do not move about very quickly at all, which is a characteristic that makes them easy subjects to shoot. Often it is not the case of 'the one that got away', but the case of 'Oh no! I have run out of film again!'. These can be quite addictive subjects and there are even photographers out there only interested in opistobranchs and nothing else. Yes, they are a very strange mob these underwater paparazzi. These slugs have enormous variations in body forms. One species in particular, Umbraculum umbraculum, has a very hard external shell, though hardly sufficient for the slug to withdraw into. Like their collective name refers to, these slugs' gills are located between the mantle and the foot, usually on the right-hand side. They are carnivores, feeding on sponges, ascidians and other invertebrates. Members of the genera Pleurobranchaea have been known to feed on other opisthobranchs and small fish. Most fish instantaneously spit out their notaspid prey, because many can exude sulphuric acid as a form of defence- quite a shock to the unsuspecting finned creature. The gills are not readily visible. From our personal experience, we generally came across Pleurobranchs during night dives in Sydney, except Umbraculum umbraculum, which we often see in the daytime. Recommended dive sites: Sydney Harbour, Shark point, Clovelly pool, Thompson's Bay (a.k.a. Gordon's Bay), Bare Island, Kurnell, Oak Park, Shiprock. This order of slugs has so many beautiful representatives, though it seems that many species are more at home in warm tropical waters. The body shapes of sacoglossans vary as much as nudibranchs, some even have external characteristics similar to aeolids, such as cerata. Although the sacoglossans' cerata-like appendages do not contain the cnidosacs, which are the storage compartments for nematocysts of the aeolids’ cnidarian prey. 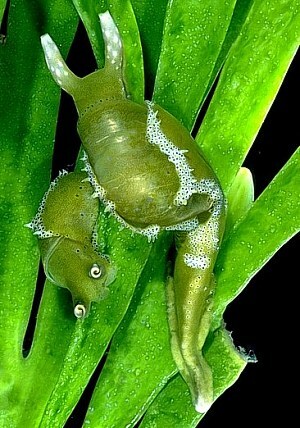 Sacoglossans are mainly herbivores with the exception of a few species, which feed on eggs of other species of sea slugs. They have extremely sharp teeth, perfectly evolved to pierce green algae, even retaining the chloroplasts from these aquatic plants. Elysia sp., a very common east coaster. Oxynoe viridis can also be seen in shallow seagrass areas. Some species of sacoglossans, however, have evolved branches of their gut that ramify throughout the body wall and contain plastids, which become the photosynthesising centre for the slug. In many cases these plastids are chloroplasts, but sacoglossans feeding on red and brown algae have also been reported to keep the plastids from these algae alive and operating. Recommended dive sites: Camp Cove, Fairlight, Clifton Gardens, North Head, Chapel steps, Bondi, Shark Point, Gordon's Bay, Bare Island, Kurnell, Oak Park, Shiprock.